The Great Market Hall in Budapest is located in the Pest side of the city, with two floors of food and souvenirs that both locals and visitors love to shop at. Shopping there can take an hour or more, so make sure you plan some time for browsing and comparing prices if you choose to visit this 19th century-style mall. The Great Market Hall consists of two floors that sell very different items: traditional Hungarian crafts and souvenirs on the top floor and food on the ground floor. The Great Market Hall is called Nagyvasarcsarnok in Hungarian. It is also known as the Central Market Hall and the Great Hall Indoor Market. Vendors accept cash (Hungarian forints). You can also use your credit card, which may come in handy if you spy a more expensive souvenir you can't live without. A pay restroom is located on the top floor. It will cost you a few forints to enter. Have coins ready. 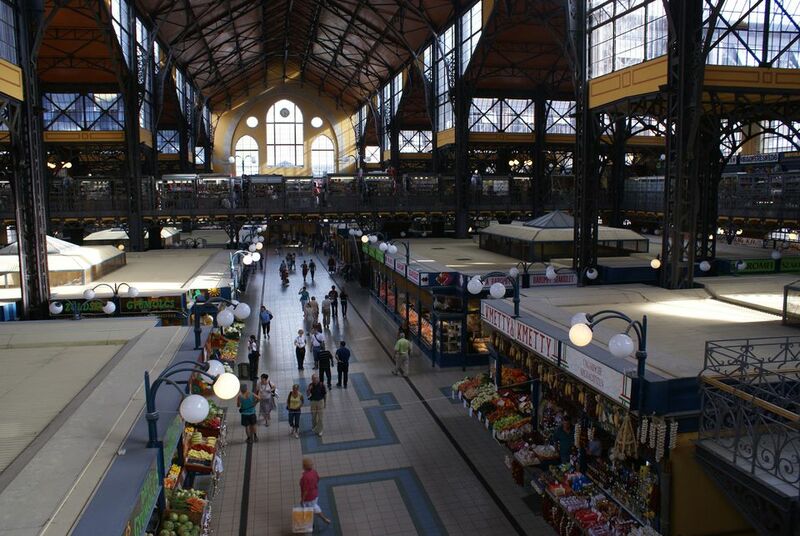 The Great Market Hall is located on Fővám tér at the Pest side of Liberty Bridge. The ground floor of the Great Market Hall is devoted to food items. Pastries, fresh produce, meats, cheeses, wine and liquor, and other Hungarian foodstuffs can be purchased here. The range of products is almost overwhelming! Each pastry display or produce cart will have your mouth watering with anticipation. Lots of vendors also serve up hot snacks and lunches at this indoor market. Try the ​​langosz, a type of bread that you can order with a variety of sweet or savory toppings. It's versatile, tasty, easy to take with you, and large enough to share with a friend. A great souvenir, as well as an important Hungarian product, is paprika. Paprika is the most famous ingredient in Hungarian cooking and flavors national dishes such as goulash soup. Stalls sell paprika in canisters, which means you can take the flavors of Hungary home with you if you choose. Also, notice the dried peppers hanging in clusters around stalls selling produce. This is how paprika looks before it is ground into a powder. Even if the top floor of the Great Hall indoor market interests you for its selection of souvenirs, do take the time to sample something from the food stalls on the ground floor. You can even grab a cheap and tasty lunch before you head off for more Budapest sightseeing. The top floor of the Great Market Hall, or Grand Market Hall, in Budapest is devoted to traditional Hungarian crafts and souvenirs. Some of the items you can look for while shopping at the Great Market Hall are dolls dressed in Hungarian traditional costumes, folk embroidery in the form of shawls and home decor, Hungarian decorated Easter eggs, porcelain and leather items, and handmade soaps and wooden toys. Find gifts for loved ones, Christmas gifts from Hungary or a special memory for yourself. The vendors speak English and prices are usually clearly marked. If you are unsure about the price of an item you are interested in, just ask. While it isn't always clear who is working which stall, you can catch the eye of the correct person if you scan the immediate area. Most travelers find the prices at the Grand Market Hall to be reasonable. It doesn't hurt to compare prices of similar items offered by different sellers when you are there, though. For example, if you are like the looks of a particular embroidered item but don't care for the price, you may be able to find a similar item that was made with different fabrics at another stall for a lower price. The Great Market Hall has been a part of Budapest's landscape for over 100 years and its significance extends beyond its function as a location where merchants can sell their wares. The Great Market Hall, also known as the Central Market Hall, was the first of other covered markets that were planned for Budapest at the turn of the 20th century. The building of the market hall accompanied the enactment of rules that governed food and product inspection and that sought to create a fair system for vendors who wished to sell their products in the stall. The Great Market Hall was also constructed during a time when the city of Budapest's development was enjoying a rapid rate of increase. Many of Budapest's most important and most beautiful structures were built during the latter half of the 19th century. Before covered marketplaces came into being, vendors sold their wares in the open air. With the introduction of the market halls, both merchants and customers could sell and shop year-round while protected from the elements. The original market hall was built to accommodate horses and wagons that would bring goods to the stalls. Similar to many buildings in​ Europe, the Great Market Hall suffered from damage during WWII. Though reconstruction was undergone, it failed to maintain the integrity of the building's original design. Though the Great Market Hall fell into disrepair in the 20th century, it was renovated in the 1990s to restore it more closely to its original form. Today, the Great Market Hall is an elegant building and shopping there is a fun activity for visitors to Budapest.